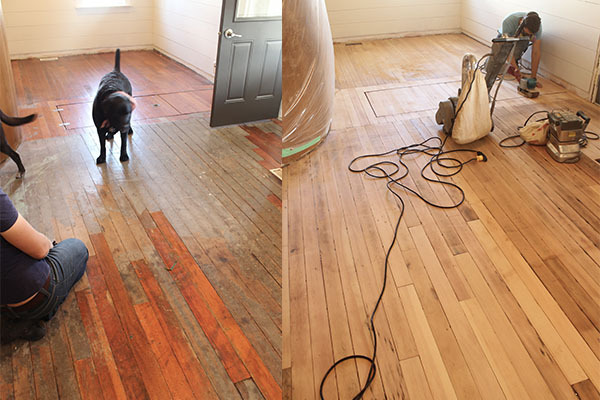 Restoring hardwood floors can be challenging. Years of traffic, dropped items, scratches from bedposts, fires, and floods leave behind damage. Refinishing the hardwood floors in our home meant dealing with all those things. Over the last century, these floors saw everything. I still insisted on salvaging them They were the only historical pieces left in the entire house and I did not have the heart to tear them out. Luckily oak is wood that can stand the test of time. 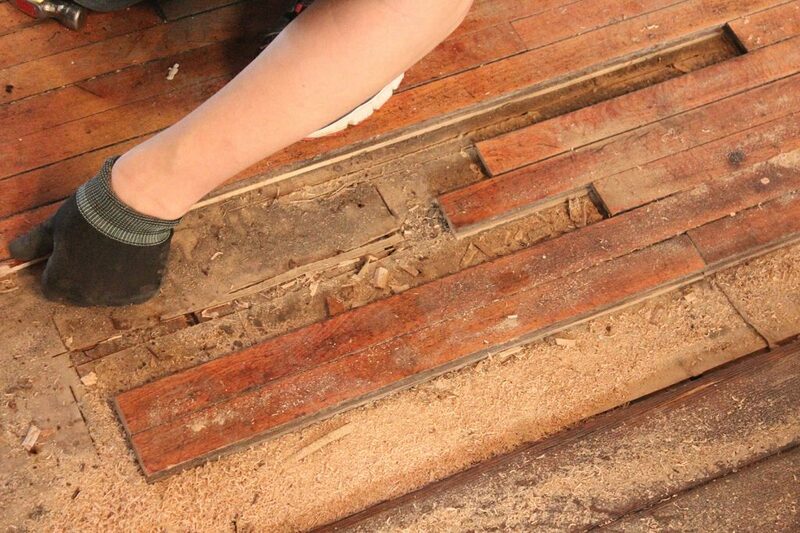 If you can find old oak floors, the likelihood of restoration is high. Even if you think your hardwood floors are beyond repair, you may be able to breathe life back into them. I present to you our floors as proof that anything is possible when you’re working with wood. Many people told us they were beyond repair. Good thing I’m stubborn. I’m hesitating to post the before photos. They were that bad. The floor in the kitchen was beyond restoration (so they said). 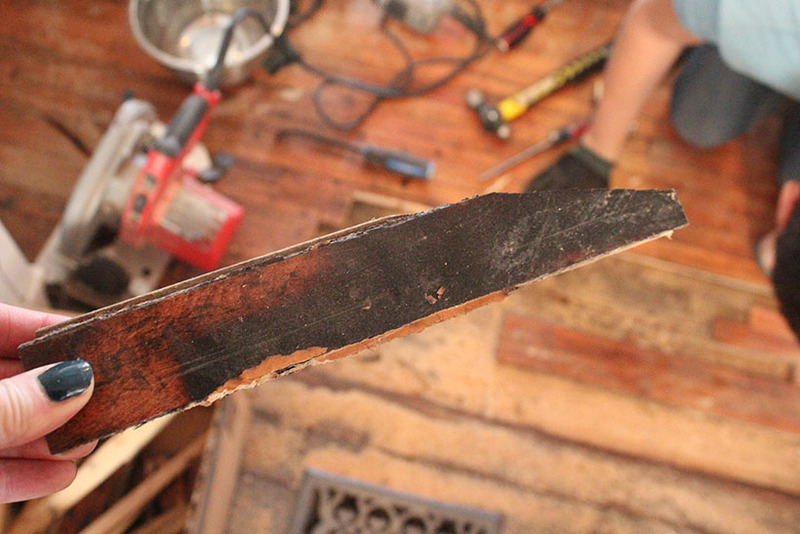 We found evidence of a flood, a fire, and a DIY attempt that went wrong. Whoever attempted to restore these floors gave up midway. They tossed down a 1/4 inch of leveling compound, some linoleum and called it a day. 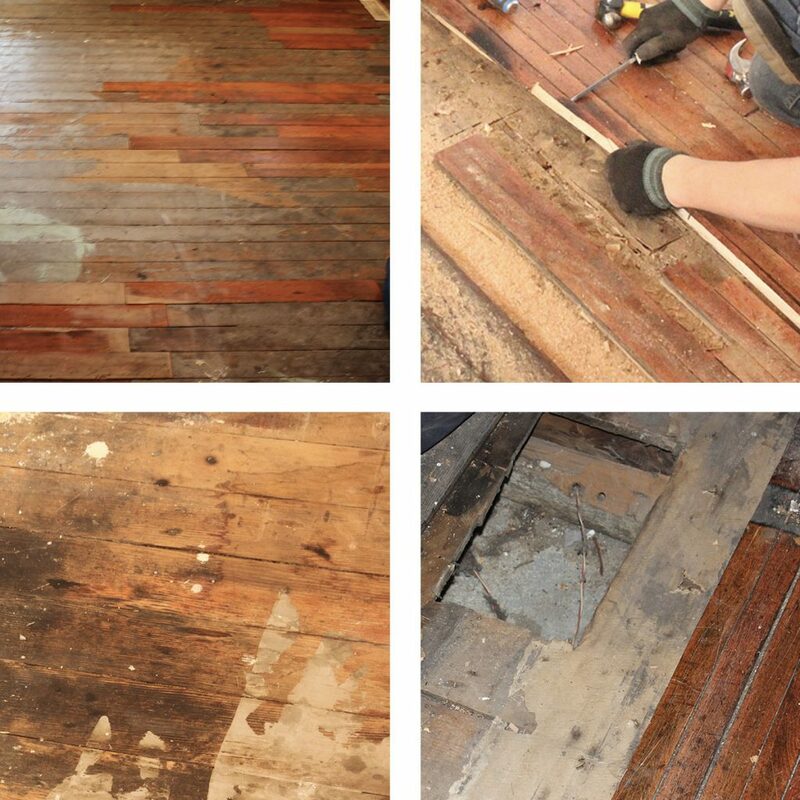 Restoring this floor would prove to be a challenge. Our living room was in slightly better shape, but it still had its issues. The boards that we replaced in the living room had cracks with fissures of black charcoal. They didn’t look like charcoal… they were charcoal. How something burned down that much and didn’t burn the entire house down is beyond me, but here we are. The house still stands. There were also scratches, gouges, raised nails, cigarette burns and permanent marker! Oh, my. It took a full month to repair all the damage before we could even start sanding. We lucked out. Our bedroom floor was a combination of two different types of hardwood flooring. It had both 1 1/2 oak which matched the living room and 3.5-inch boards that matched the kitchen. Since we had to pull up all the miss-matched boards, it made sense to use them to replace the damaged hardwood in the rest of the house. That was my husbands genius idea. He’s a keeper. He probably regrets that idea. If you have damaged boards that need replacing you may be able to take some from an inconspicuous area like a closet. We started our repairs by marking the damaged floorboards that we could not refinish. After a careful inspection of each board, we realized we would need to replace 30% of the kitchen boards. A piece of cake right? I found a few tutorials online about replacing a single board but couldn’t see any that did what we were about to do. You know why there are no tutorials? It’s not the best way to do it. If you install the boards incorrectly, you risk the integrity of the entire floor. Wood floors need to breathe. They contract in winter and expand in the summer. Install them too tight, and your boards will pull or warp. We took our time and did each step carefully. It was time-consuming, but it paid off in the end. 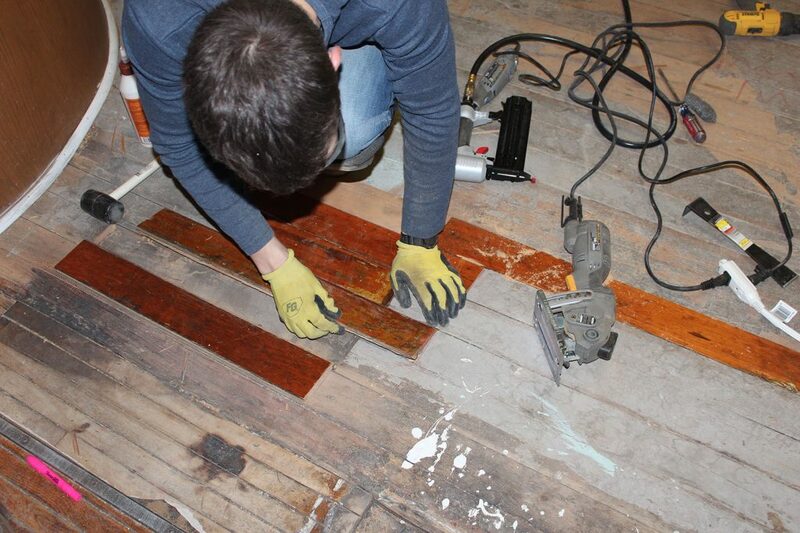 Step Two – How to remove broken boards. We started with a drill and a chisel. The work was slow going. We had to be careful not to damage the wood that was remaining but chiseling it all out was going to take far too long. That lasted an hour before we gave up and made the 2-hour drive to the city to get a mini saw. With the mini saw, we were able to cut out large inside portions of flooring. After we cut out all the boards we could, we used the chisel and hammer to pry out the remaining parts of the boards. Restoration is slow work. You have to work around the nails and pull them out without damaging the edge of the remaining boards. Without the edge, the replacement boards have nothing to grab. Once the old boards were up, and the floors cleaned, the new boards slid into place for us without issue. We did use glue in some spots. We tried to avoid doing that as much as we could. The hardwood does need room to expand and contract and I didn’t know for sure what effect the glue would have. But on sections where we had no lip to secure the board, we had no choice. After a year of living with these floors, we haven’t had any issues. We haven’t had any boards lift, or shift or even warp. We used a drum sander. There is a lot of information on the internet about the pros and cons of both the drum sander and the orbital floor sander (not to be confused with your handheld orbital). I can tell you that we’ve used both in this house and I loved the drum sander. The drum sander did its job and did it quickly. It was also fun to use. I sanded the floors myself with no prior experience and was pretty pleased with the outcome. The first pass had me in awe of the drum sander. This picture is blurry, but I added it so you could see how much flooring the drum sander removes in a single pass. 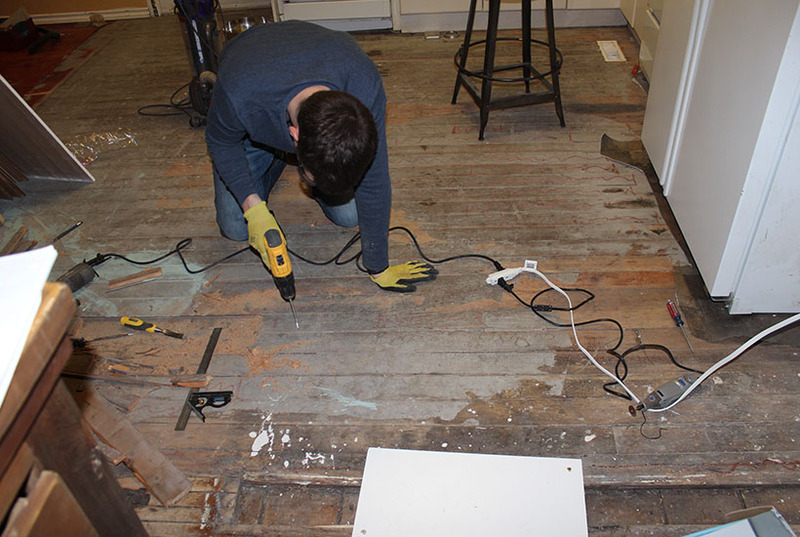 This photo shows our first pass over the worst parts of the kitchen floor. Also if you don’t empty the bag, it will kick up a lot of sawdust. Don’t fear the drum sander. The orbital, on the other hand, made me pitch a fit. Never in my life have I been that frustrated. I can’t even look at an orbital floor sander without giving it the stink eye for a full minute. The orbital floor sander was slow. So slow. Painfully slow. It took me 4 hours to get the same amount of flooring off that the drum sander did in one pass. Listen to me – get the drum sander. Did we leave drum sanding marks on the floors? Yes, we did. Did I care? No. The restored hardwood floors look rustic, and the few dings that we did make with the sander didn’t matter. They are not at all noticeable unless you get down there to look. 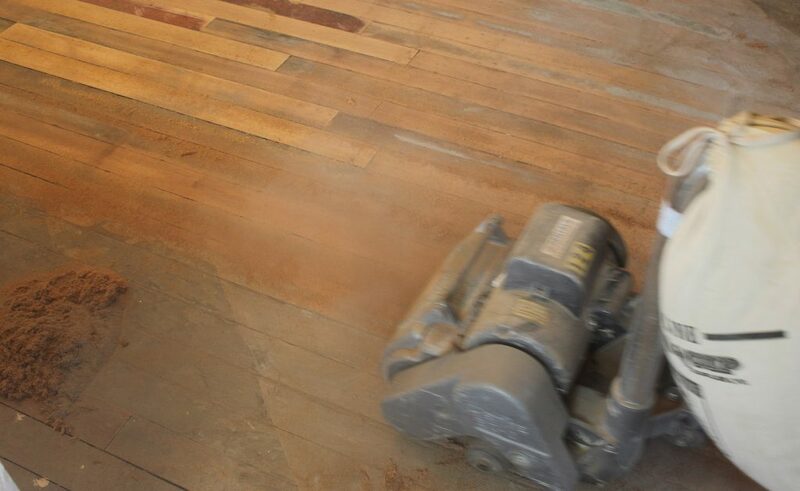 Step 4 – The process we used to sand our hardwood floors. We used four different grits, starting with 40 for the kitchen. 40 is like using small sharp rocks to remove a good deal of wood and scratch the hell out of everything. We used that grit to level the kitchen floors and remove the leveling compound. It worked like a charm. Regular floors don’t need to start at 40. If your hardwood boards are as bad as ours were and you need to remove a lot from the top, 40 is the way to start. It’s important to note that you need to know the thickness of your floors. Our floors were 3/4 inch and had no evidence of prior sanding. We could take a lot off the top before the oak couldn’t handle any more sanding. We did four different passes with four various grits. Each time the floors revealed more of their beauty. It kept getting better and better. Step 5 – You also need to sand the edges, don’t forget to rent the edger! We also rented the sanding edger. You need this sander to reach the areas where the drum sander can’t reach. The floor sander leaves about a 4-inch rim around your floors that you will have to sand. You could try it with a standard orbital, but I can tell you from experience that’s a bad idea. The drum sander removes a lot of flooring. You would have to be on your hands and knees for a long time trying to match the levels. The edger does this in a few passes. It’s magical. It took us 8 hours to sand & edge 400 square feet. We had to do four full passes with the sander and the edger. 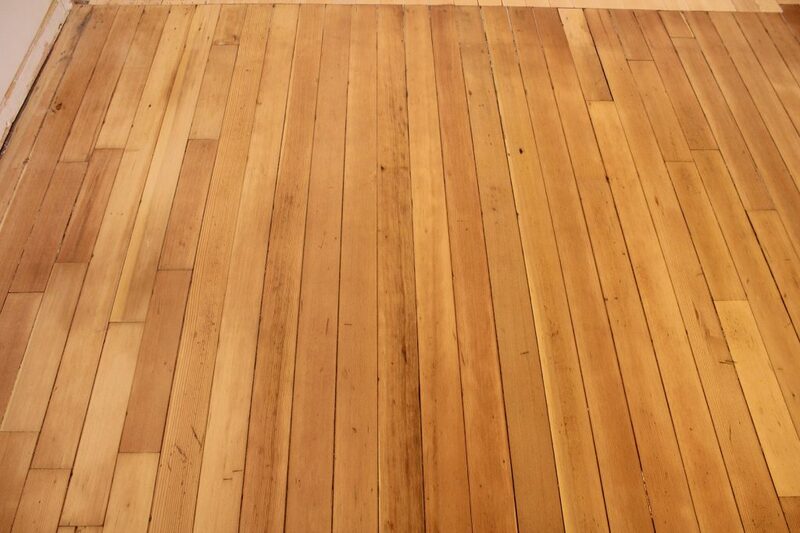 Step 6 – Preparing your newly restored hardwood floors for stain. Sawdust was EVERYWHERE. Seal your rooms if you are going to do this and save yourself two months of cleaning. I recommend a quick clean up after sanding. Get the bulk of the sawdust out, give everything a good sweep, and leave it until morning. If you do the detailed prep work the same day, I can guarantee you’re going to have more sawdust settle overnight. You will end up cleaning everything again a second time. Cause that’s what happened to us. We spent two solid hours of clean up. Swept, vacuumed everything including the walls and ceilings. Wiped down everything with a tack cloth. I thought I would get up in the morning and start applying the stain. That’s not what happened. So much dust settled that I had to do it all over again. You need to ensure all dust is gone. You don’t want particles in your stain or sealer. It’s a tedious job but one that will make or break your final finish. 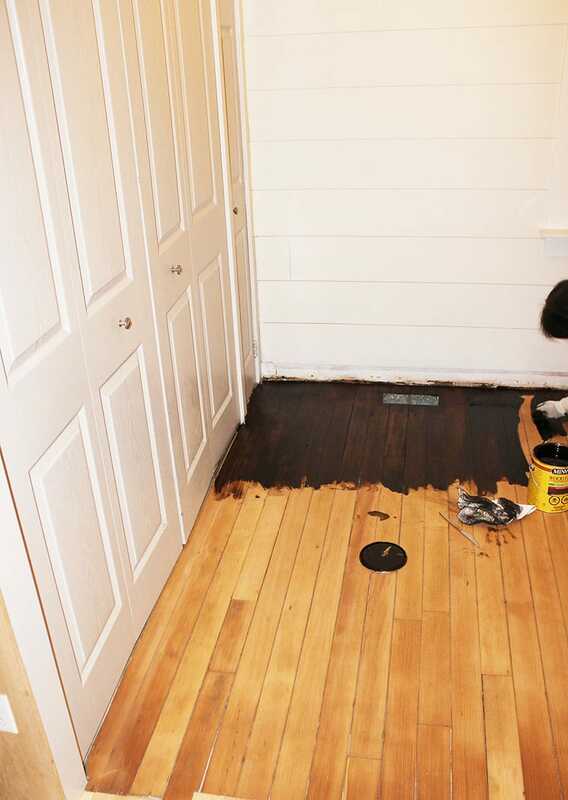 Step 6 – The simple process we followed to stain our floors. Staining the hardwood floors was a simple job. I mentally blocked off 4×10 areas, applied my stain, waited 10 minutes and removed it with a clean rag. I repeated until I finished the entire floor. It went quickly, and it was amazing to watch the oak floorboards change color. We didn’t need two coats of stain. One coat gave us the finish I wanted. We used Minwax Dark Walnut and applied like a dream. It gave us a beautiful mid warm brown finish. I loved it. Dark hardwood floors need constant cleaning to look good because they show every single spec of dust. They were not my first choice. So why did we go with the dark stain? It hid every single minor imperfection. Small gaps, tiny burn marks, even the dings from the sander vanished after applying the stain. It was like magic. 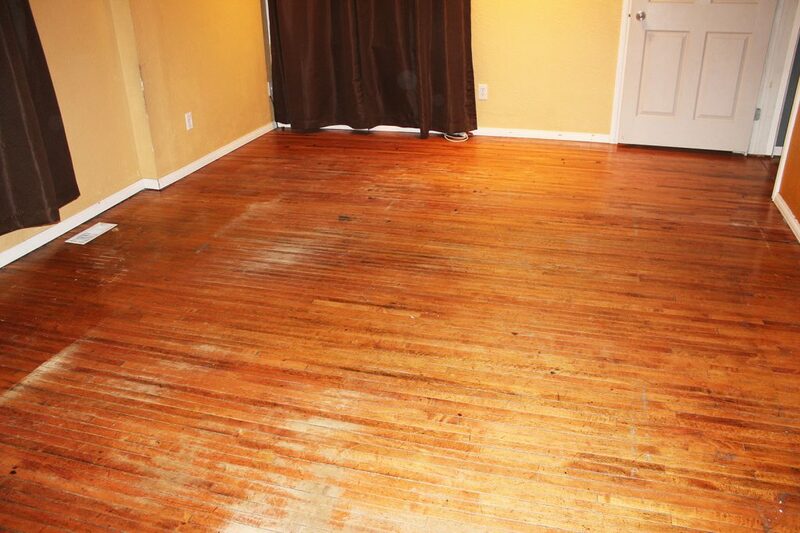 Dark stain + old floors = magic. We let the stain dry for 24 hours before applying our sealer. Step 8 – The even more straightforward process we used to seal our new floors. Sealing the floors was the best part. Adding the layer of shine brought out the wood in the most magnificent way. You can see in the photo below how the sealer changes the look of the wood. Half the floor was sealed when I stopped to take this picture. We opted to use a water based polyurethane. We needed access to the house again, and this polyurethane dries the fastest. The polyurethane we used was also low VOC, and it didn’t stink to high heaven. It did smell bad, just not as bad as most polyurethanes. We used Minwax low VOC semi-gloss polyurethane, and it worked great. I used a stain sealer on a broomstick. Each pass only took about 30 minutes. You do need to be careful with the sealing pad. Too much pushing with too much sealer on the pad will create bubbles. I do have bubbles on my floor, but you can’t see them. I can see them because I know they are there. They annoy me. Save yourself that hassle by going slow and not soaping up the polyurethane. We were able to get three coats of our water based poly on in 24 hours. It was dry and hot outside, and the sealer was drying for us pretty quick. Can you believe they are the same hardwood floors? The after photos all look different colors, but all the floors are a warm brown like the very last picture. When I took these photos, I was using a potato. Was it worth it? YES. I love my floors. It cost us 1.00 (Canadian) a square foot for the sander rentals, sandpaper, stain, and polyurethane. They are not 100% perfect, but I’m okay with that. 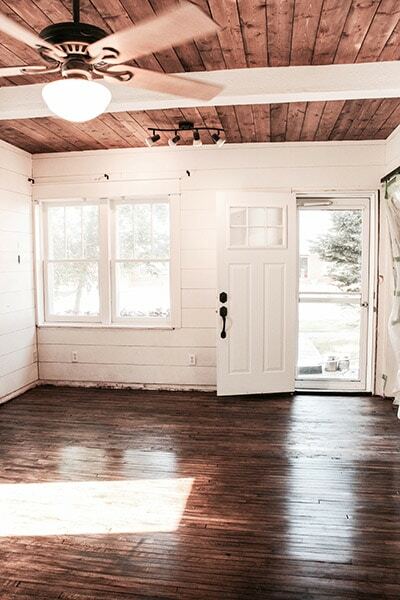 These restored hardwood floors have a rustic charm that adds a lot of personality to the house. If you’re sitting on hardwood floors that are covered up by linoleum or carpet, you should have a peek. You might not have to repair anything. 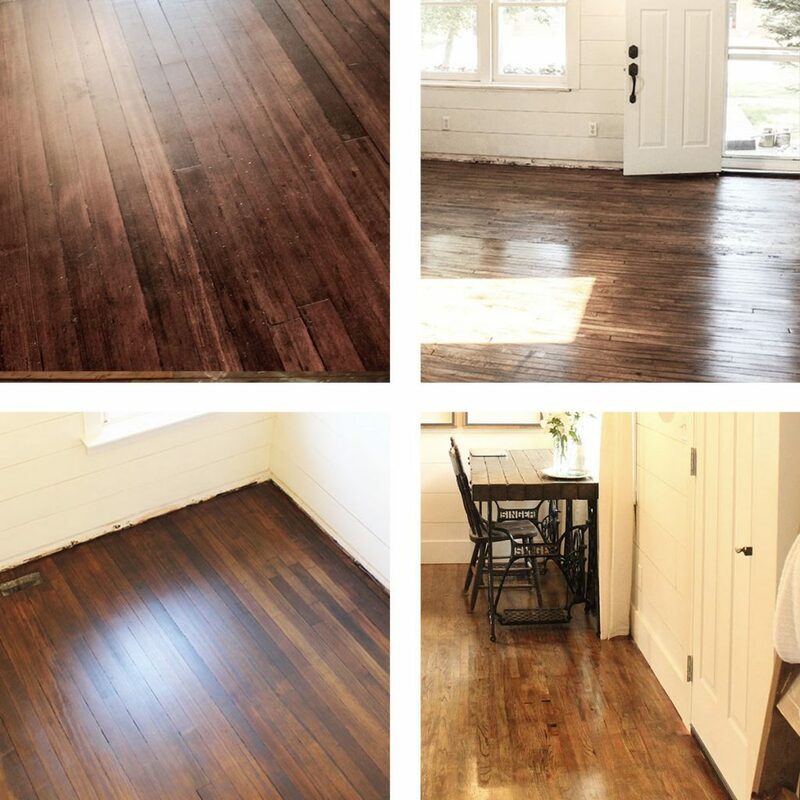 Your floors might only need a refinishing job. Although our hardwood floors took months to restore, the actual sanding, staining, and sealing happened over one single long weekend. If you have any questions about our floor restoration, feel free to drop me an email or leave a comment. Hi! I love your blog and these restoration posts! What stain and finish did you use for your floors? Also, what baseboard did you use? For background, I recently bought a home that had horrendous carpet, peel on vinyl, 1970s vinyl, laminate flooring… pretty much everything and anything in the book. Low and behold, beneath all of this flooring and sub-flooring are original hardwoods, which are in terrible condition, but according to my contractor, salvageable! I love the color and look of you floors and would love to recreate it! Hi Colleen, we used Minwax Special Walnut. Our main floor had both white oak and red oak, so the stain looks a bit different in different rooms. No one seems to notice except me, but I was up close and personal with them. We also used Minwax Low Voc Waterbased satin poly. I would 100% skip the waterbased finish next time and go with oil stain and your contractor will probably recommend you go that way. It lasts longer, provides a better finish that just feels more protective. We didn’t have the time to wait for the oil-based finish to dry, so we opted to water-based. Our baseboards are a huge cheat. We needed to replace all the baseboards in the house and I wanted something a bit more substantial vs rinky dinky 3 inch MDF trim boards…but wood trim was not in the budget. We bought 3/4 inch MDF boards and had them cut to size. We went with the original 1900’s sizes, so our trim boards are a full 6 inches high (not 5.5) and our trim around our doors and windows are a full 4 inches thick (6 inches on the top). Having the MDF sheets cut saved us 70% and we were able to get custom sizes cut. The raw MDF boards require about 3-4 coats of paint, but once it is painted you would never know it was MDF, it straight up looks like wood. I’d LOVE to see the restored floors when you’re done! If you have any other questions feel free to drop me a line anytime. Thanks for the comment and good luck with your restoration. I love this tutorial! It brings back memories of my own floor finishing projects, including the ones removing 200 years of layered pumpkin colored paint off the floors of our 1803 cape cod. Lead paint, no less. 6 Rooms worth. That was a bear of a project. I also remember the guys at the drum sander rental place laughing at me when I went in to pick it up. They were convinced I couldn’t handle it, but I sure proved them wrong, lol! It really was not that hard at all. The edger was harder, having to be bent over to work. The results are worth it, though, as you have discovered. Thank you for the blog and the memories. Ooof, 6 rooms, does sound like a big job! My husband did all the edging thankfully. I was done with the drum sander long before he finished with the edger. I had it easy. I don’t know if I got more satisfaction from the results of those floors or for doing despite the naysayers and doubters! Thanks so much for your comment, it absolutely made my night.